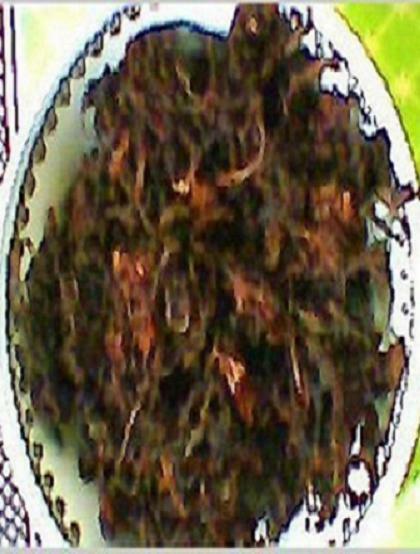 Gundruk is cured and sun-dried green leafy vegetable (Saag). It is the most popular food item which can be easily made in home. It is available in almost all the houses of Nepal and is liked by all the Nepalese people and those who have the exp-erience of tasting Nepali food. It has got sour taste and gives acidic and cured smell. It is Brownish Black in color. Though in Nepal some of the food items are specialised only for the specific ethnic groups but Gundruk is used in society of every ethnic group. 1.Collect some old leaves of leafy green vegetable such as Spanich, radish etc. and wash them. 2. Cut those leaves in medium size and let them dry for one day. 4.Pour excess luke warm water in the pot and cover the pot with straw. 5. It start secreting lathery bubbles from the second day and lwave as it is for around 7 days. 6. At eighth day drain the water without washing and leave cured leaves to dry in the sun. 7.Finally yourGundruk is ready. Now try the given receipe. Sadeko Gundruk infact is a pickel made fromGundruk.First of all Gundruk is soaked in water for 5-10 minutes In the mean time a paste of chilly, salt, garlic and corriander is prepared.Then, the soaked is mixed with the paste. One tea spoon Mustard oil is then mixed for better smell. Fresh corriander leaves can be used for garnishing. Now your Sadeko Gundruk is ready to servre. It can be eaten with rice ,rice beaten and as a refreshing dish. Gundruk curry is a soup type curry made from Gundruk.It has a simple methodology. First of all the oil is put in the pan. Then salt, turmeric powder, corriander powder, haldi powder,zeera powder and garlic paste is fried in the oil. Finally, Gundruk and fresh garlic leaves are also put in the same pan mixing. After cooking 2 minutes, 3-4 cups of water is poured and again cooked for about 5-6 minutes until it boils. Then the fried soyabeans are mixed to the soup and it is called Gundruk Bhatmas ko Jhool. Your soup is ready serve it with rice or Dhindo.